CHICAGO—The scene inside the Leighton Criminal Courthouse was quiet as the 200 men and women filed inside the courtroom of Judge Vincent Gaughan to begin filling out questionnaires that will later be used to determine if they will be selected as one of the 12 Cook County residents to serve as jurors on one of the highest profile murder cases in Chicago’s history. The trial of Chicago Police Officer Jason Van Dyke, who was charged with the four-year-old murder of 17-year-old Laquan McDonald, is being watched locally and nationally by Blacks who live under the threat of police violence daily—and by those who support the policing and keeping law and order, no matter the cost. Officer Van Dyke shot the teenager—who was holding a knife—16 times. He initially claimed Laquan moved in a threatening manner towards him and his partner. However, the speed at which the city moved to settle financially with the McDonald family, who hadn’t yet filed a wrongful death lawsuit, raised some questions. Then there was talk of dashcam video that refuted Off. Van Dyke’s and the police department’s narrative. Next came questions about lengths the Chicago Police Department and Rahm Emanuel, who signed off on the $5 million settlement a day after winning a second mayoral term, went to keep the video from public release until after the mayoral election and a run-off with the mayor was over. 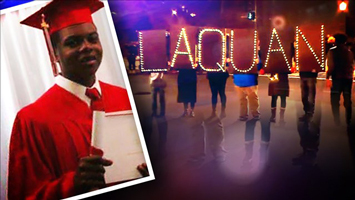 The delay and timing of the grainy video’s release, with the teen’s body wracked by bullets, spawned “16 shots and a cover-up!” chants and accusations and Chicago demonstrators took to the streets. Others outside of the city also demanded “Justice For Laquan!” calling his case an example of abusive and deadly over-policing of Blacks. Jason Van Dyke shows up for court in Chicago. In early September, prospective jurors heard from protestors outside the courthouse as they walked into the building. Feelings among those protesting outside in the sun on a hot, humid September day were varied. There was anger and frustration with police, while others hoped justice would be served based on the video alone. Some were fearful that this would be yet another case where a White police officer would be allowed to kill another young, Black man and go free. The jury selection phase of the Van Dyke trial, ironically, began one day after Mr. Emanuel announced he would not run for a third term as mayor. Mr. Emanuel has faced a bevy of criticism during his time in office and many outside the courthouse openly speculated that this trial had a lot to do with his deciding not to run. 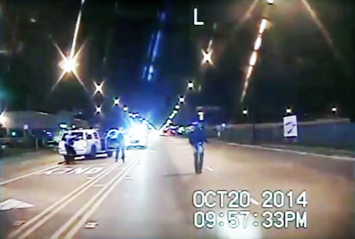 In this Oct. 20, 2014 frame from dash-cam video provided by the Chicago Police Department, Laquan McDonald, right, walks down the street moments before being shot by officer Jason Van Dyke in Chicago. Van Dyke, who shot McDonald 16 times, was charged with fi rst-degree murder, Nov. 24, 2015. The video has no sound, nor do videos from four other squad cars at the scene. But police protocol indicates that all the cruisers should have been recording audio that night. “If yesterday proves anything, it’s that Laquan McDonald rests in power. Laquan McDonald should get justice and will get justice because of people like you,” Alderman Carlos Ramirez-Rosa of Chicago’s 35th Ward, said to protesters, many of whom belong to activist groups who had been loudest in calling for the mayor to step down. However, other protestors and activists felt Mr. Emanuel’s decision was no cause for celebration. His decisions have already devastated Chicago’s Black neighborhoods, which are among the city’s poorest communities, they said. Ms. Hernandez during her address to protestors, mentioned the Chicago Police Department consent decree, a legally enforceable and federally overseen set of guidelines for departmental reform suggested as the result of the Department of Justice investigating the department in the aftermath of the McDonald shooting. Mr. Emanuel pushed back against Illinois Attorney General Lisa Madigan, who wanted to add language in the consent decree requiring officers to document each time they draw a weapon and point it at someone. However, on Day One of the trial, Mr. Emanuel agreed to the language which will be presented to U.S. District Judge Robert Dow Jr. on Sept. 13. Many of those mourning lost loved ones due to police violence, took no solace over Chicago having a lame duck mayor. They are more interested in justice for Laquan and others who were killed after encounters with police. “We still have a long right ahead,” said Tiffany Boxley, mother of Joshua Beal, who was shot and killed in November 2016 by an off-duty Chicago police officer and sergeant in the predominantly White Mt. Greenwood section of Chicago. “We need justice for Laquan, we need justice for Pierre Loury, we need justice for Ronnie Man (Ronald Johnson), we need justice for Joshua Beal, we need justice for Rekia Boyd. We need justice for all our young brothers and sisters who were out here slain at the hands of the police, who are supposed to protect us,” said Ms. Boxley. 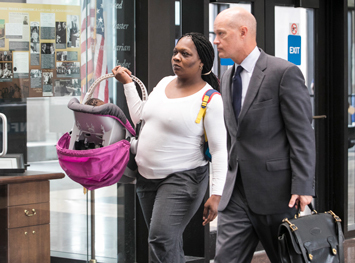 On Day 2 of the trial Sept. 6, Jason Van Dyke stood before Judge Gaughan to face charges of violating the conditions of his bail by granting interviews to two local media outlets just days before the first phase of his trial was to begin. Mr. Van Dyke was at risk of having his bail revoked and being sent back to Cook County Jail for the duration of his trial. However, while Mr. Van Dyke was found to have violated the decorum order issued by the court, his bail was increased by $2,000, of which only 10 percent—or $200—was required to be paid as a condition of his release. Upon the judgment being made, two members of the Chicago Police Department, each handed Mr. Van Dyke’s father $100, essentially posting his bond for him. Will Calloway, a community activist who was instrumental in ensuring the dashcam video of the Laquan McDonald shooting was made public, felt the bond increase of Van Dyke was fair. Now that potential jurors completed questionnaires, the selection process was set to begin. 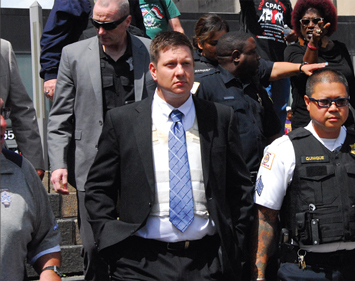 Jason Van Dyke’s defense team has argued for a change of venue, saying publicity surrounding this case made it impossible for Van Dyke to receive a fair trial in Cook County. His lawyer, Dan Herbert, argued that all 200 potential jurors questioned on the first day be thrown out. They were influenced by the courtroom cameras and the throng of protestors they had to pass as they entered the courthouse, he said. Judge Gaughan said he was confident the screening process could whittle away jurors who hold any sort of bias where this case is concerned. Jury selection was expected to take place for the better part of the second week in September, but activists say they are in the fight until the end.